The Tiangong-1 Chinese space station is moving along a decaying orbit. It should re-enter our atmosphere in the next few weeks, so we have just a few more chances to observe it. Some surviving debris could fall to Earth’s surface, with large uncertainties as for the exact location. The Tiangong-1 space station is still visible, before it is destroyed (hopefully completely) by our atmosphere. I managed to cover one of its last, brightest transits, with a few more likely visible in the near future. On 9 Mar. 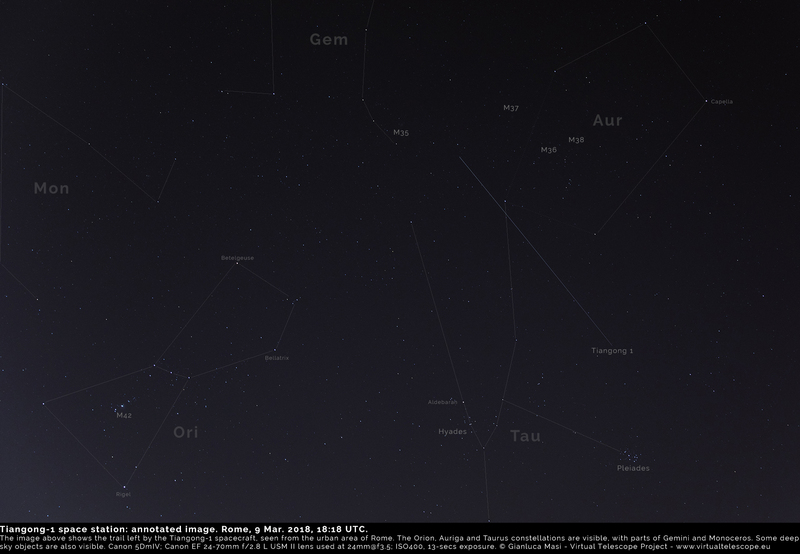 2018, the Tiangong-1 was expected to cross the sky above Rome, peaking in brightness at mag. 0 (like the star Vega). It was the first day of clear skies after so many weeks of bad weather. I managed to setup my imaging device, consisting in a Canon 5D mark IV DSLR body and a Canon EF 24-70mm f/2.8 L USM II lens, both installed on a sturdy tripod. The place was under severe light from streetlamps. The transit’s details were retrieved via Heavens Above website, resulting very favorable for Rome, with the space station reaching an altitude of 74 degrees above the horizon, safe from huge light pollution contamination, and placing the spaceship in a very interesting spot of the sky, hosting the very beautiful, winter constellations of Orion, Taurus and Auriga. I set the camera to work at 400 ISO, properly orienting it to include the stars I wanted, choosing to work with a focal length of 24 mm and a 13-seconds long exposure, to avoid too much star trailing (the camera was on a tripod, with no star tracking). I managed to start a imaging sequence, to capture as many images of the transit and to select the one offering, to me, the best sight. The spacecraft showed perfectly on time and it was a nice sight with my own eyes: I enjoyed its bright show while the camera’s shutter was working to capture it as I planned. At some point, as expected, the Tiangong-1 disappeared, jumping into the shadow of the Earth. 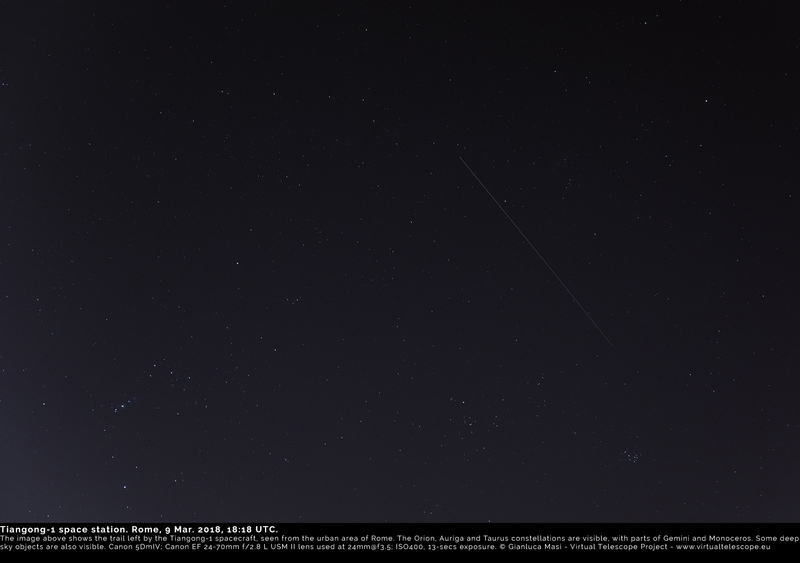 The image above, with some little luck, is exactly what I wanted: the trail of the Tiangong-1 Chinese space station is showing very well, almost brushing the bright star Elnath (Beta Tauri). 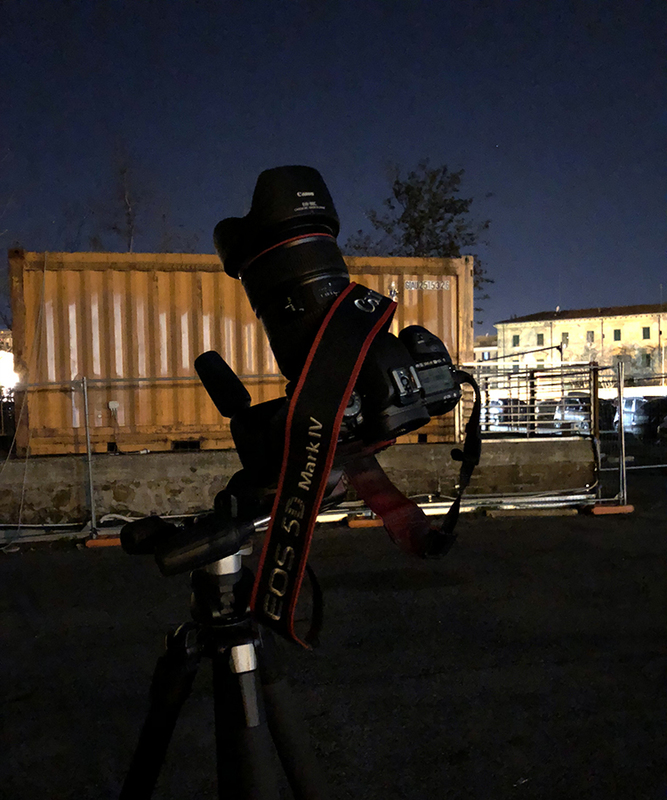 Carefully working on the RAW image, I could extract many stars all around, despite the severe light pollution at the observing site: several deep sky objects, including the Pleiades, the Hyades and the Orion Nebula (M42), are well visible. The image below shows “who is who”. I suggest you to check if one of the few, remaining transits will be visible from your own location. If you are interested to learn about the future of Tiangong-1, you can check this link. I will try to imaged it again, if weather will help!